Find all types of special needs services in New York, including animal assisted therapy and many other services. Search for a slew of fun activities for special needs children in NY. 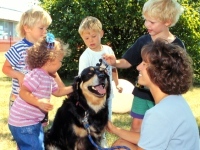 Find animal assisted therapy in NY that caters to special needs kids and adults. Whether you're looking for equine therapy in NY or other types of pet therapy in new york, we've provided you with a comprehensive guide.